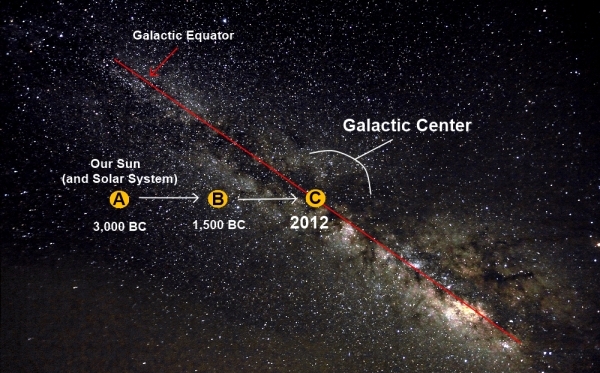 The Closing of the 2012 Galactic Alignment – Winter Solstice 144 & The Birth of a Better Age? Most of you will know that on the 21-12-2012 the Mayan calendar ended a grand 5125 year-long 13 Bak’tun cycle (13 x 144,000 days). On that same day, at 11:11 GMT, the sun rose into conjunction with the galactic centre, forming the infamous galactic alignment of 2012. There is good reason to suspect that the Maya people were indeed tracking this very event with their Long Count calendar, this happening being something like the 12 o’clock position. Exactly why they were tracking it, and what they expected would happen, these remain points of some debate. For most of my life, I have been living during the era of the galactic alignment. On the 21st of December 1980, for the first time in 26,000 years, the Solstice sun rose into an area of the sky that was directly between Earth and the great bulge in the Milky Way, the approximated central region of our galaxy. This event has been happening every December solstice since then. On the 21st of December 2016, this conjunction will happen for the last time, it will recur only after another 26,000 years of precession has passed. We do know that for the Maya people the galactic centre, as well as an area we know as the dark rift (dust clouds obscure stars near galactic centre) were linked with Xibalba, the underworld, a dark place of death and rebirth. The Milky Way was often seen as the road to Xibalba. This same area is also associated with the cosmic mother, the Milky Way symbolises her genitalia, with the dark rift and the bulge near the centre being the womb and entrance to her birth canal. For the Maya, the Sun represents First Father, the masculine element. The gradual precession of the solstice sun into this central area of the sky can be seen to represent the penetration and fertilization of the galactic mother by First Father, as the sun moves away he leaves the sky pregnant, a new era of profound potential is birthed soon after. Looking around at the world today, I can certainly say that a new era packed full of potential is highly desirable. My own life became deeply intertwined with the Maya people, and their calendars, only after a profound mystical experience back in 2002, an event that I refer to as my one incidence of astral time travel. One moment I was at my computer, the next I was flying over the jungles of Mexico towards a pristine white stepped pyramid. Today I understand why that strange thing happened, even that the temple was in Palenque and that the year was 675AD. Today, I know a great deal more about my personal connections to the Maya story, a connection that transcends reality and leaves the limits of this world. That is another story, for another day. From 2007 to 2013 I ran a very popular blog (now defunct) centred on the Mayan calendar and associated subjects, 2012Rising.com. During that time, I came to know and interact with almost all the notable 2012 researchers and authors. Indeed, in 2009 I even travelled to Mexico for the 2012 Tipping Point Prophets Conference and subsequently visited many of the archaeological sites. For three days, I stayed at Palenque, fasted and connected with the ancients. It was all quite a ride. During the years of research and strangeness, associated with Maya culture past and present, there were always flows of synchronicity. Most prominent were flows of events involving three sets of numbers; 11 11, 333 and 144. The number of these synchronicities is easily in the thousands. After the 2012 Winter Solstice, which just happened to occur at 11:11 UT, the synchronicities began to focus on just one set of numbers, 144. Incredibly, the final December solstice Galactic alignment will occur at 10:44 UT. It is strangely appropriate I must say. So, this is me, Bruce Fenton, former webmaster of 2012Rising.com, author of 2012 Rising: the Last Tzolkin, formerly Itz’Kal, military commander of Palenque under Lord K’inich Janaab Pakaal, saluting the sky as the cosmic window closes. With it ends a profound era of my life, a profound era for humanity. To all those beings that took that ride with me, I salute you. Mayan people were right : 2012 + 2 + 0 + 1 + 2 = 2017…. we all are Mayan people…according to Vedic traditions, where Vedic Maya Woman Entity, with many different names, is the Mother to all Creation, and Vedic Brahman , is the Father, the “sleeping Father” …. responsive only to real human LOVE….all the best.